Francis Ford Coppola fuses Conrad's Heart of Darkness with the Vietnam war in this sprawling, ambitious film. Stars: Marlon Brando, Martin Sheen, Robert Duvall, Frederic Forrest, Sam Bottoms, Laurence Fishburne, Albert Hall, Harrison Ford. Francis Ford Coppola infamously said, “My film isn’t about Vietnam, it is Vietnam.” The production trouble is almost as legendary as the film itself. In this age of enormous follies the grandiose absurdities surrounding the three-year approach to the screen of Apocalypse Now are symptomatic. More has probably been printed during the past few weeks about Francis Coppola’ s gargantuan venture than was written in this century about Conrad’s Heart of Darkness, that short, haunting story of a good man’s deterioration into divinity on which the film is somewhat based. And Coppola himself seems to be achieving a bizarre public relations divinity, with attention shifting from the work itself to the traumas attendant upon his accomplishing it. Nor has he discouraged this displacement of emphasis; rather, he appears to encourage it, what with announcements that the film, as it developed, began to coincide with realities in his own life, that he too was moving up a river in a faraway jungle, “hoping for some kind of catharsis”; what with interviews defying the critics to do their worst and declaring that, whether the picture succeeds or fails, he is the master of his fate and the captain of his soul. During a moment in the movie when a commando group is coming ashore under heavy fire the camera swings to Coppola himself, in full directorial state, urging his troops into action. This drew applause from the preview audience; I assume they enjoyed the arrogance of the gesture. However, the subject of “Heart of Darkness” is the madness induced in a Western man who finds himself wielding power in a setting remote from customary restraints, and I wondered if Coppola, heading up that river, was approaching some haven of megalomania. Or perhaps it is just that he knows this sort of thing generates talk (as does showing the picture in its initial run entirely without screen credits), and that talk produces box-office fever. He says that he has put $17 million of his own money into the $30 million production; understandably, he wants to recover that vast sum and will dance jigs to get it. A good deal of the money went into the delays, text revisions, casting problems and typhoon wreckage on location that have beset the film, but still more of it can be seen up there on the screen. 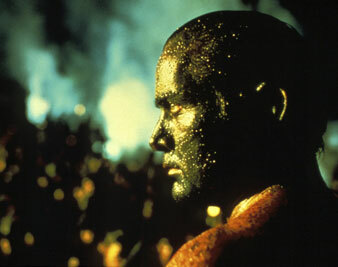 After some early routine footage to establish the central character’s alcoholic reaction both to the war in Vietnam and to the state of affairs back home, Apocalypse Now begins to move when Captain Willard (Martin Sheen) gets his orders to go upriver and assassinate Colonel Kurtz (Marlon Brando), a gallant soldier, superb leader and humane killer who has gone berserk and is commanding a body of defectors on unspecified business of his own. Captain Willard is, of course, Conrad’s Marlow, and his journey up the river is, like Marlow’s, a voyage of discovery, the difference being that Marlow discovered things about himself, whereas Willard discovers things about the war in Vietnam. Principally he discovers that it is insane and that the troops, the American troops, have been driven mad. At each new stretch of the river the stink of lunacy grows more pungent. At one point, Lieutenant Colonel Kilgore (Robert Duvall), wearing a broad-brimmed black cavalry hat, charges San Juan Hill with a fleet of helicopters. Or, to put it more factually, this latter-day Teddy Roosevelt massacres a Vietcong village and sacrifices a good number of his own men to verify his hypothesis that war is a bully game. This is also the occasion for a cute Coppola stunt: the Colonel is convinced that music from the sky panics the savages on the ground, so as the choppers sweep in for the kill, their loudspeakers rock the theater with “The Ride of the Valkyries” in Dolby Stereo. It really shakes you up. A little further along, Willard comes upon what looks like the world’s biggest amusement park, its thousands of lights blacking out the surrounding jungle. It is a combination R.&R. area, supply dump and black market for drugs. Troops by the hundreds gather in an amphitheater surrounding the helicopter pad, where presently arrive a trio of Bunnies, one of them played by Cyndi Wood, 1974 Playmate of the Year. These three wave their fannies until the G.I.s erupt onto-the platform and the girls are saved from dismemberment only by their quick-thinking disk jockey companion, who had come armed with a pocketful of tear gas cartridges. Willard approaches Do Lung Bridge, on the border of Cambodia, as the Vietcong are in the process of destroying it-said to be a nightly occurrence. The program notes specify the quantities of explosives and flares, rockets, smoke bombs, etc., that were consumed in this scene, and the effect is assuredly sense-boggling, with Dolby Stereo again in full voice. However, the point to be made-that no one is in charge-has already been sufficiently established. Coppola understands who did what in Vietnam-he is no Deer Hunter-but he can’t resist the Cecil B. De Mille opportunity. His most telling scene is a rather small one, in which the boat crew, five or six decent, ignorant boys, massacre a sampan full of unoffending Vietnamese for no reason but nervousness. Overall, however, the moral indignation by which he professes to be moved is lost in giantism. Dennis Hopper; who plays the film’s equivalent of Kurtz’s Russian acolyte in “Heart of Darkness,” appeared recently in Tracks as a hallucinating sergeant bringing a comrade’s body home from Vietnam. It’s a small picture, made for less than it cost to blow up the Do Lung Bridge, but for me it encapsulates the horror of Vietnam. Apocalypse Now speaks of horror-it must do so, for ”horror” is the last word on the lips of Conrad’s dying Kurtz-but I fear the picture will be remembered for the fireworks. And anyhow, as Conrad made plain, the source of the horror lies far from the jungle. Finally, Willard reaches Colonel Kurtz’s headquarters, a ruined temple populated by fantastic ex-G.I.s and liberally decorated with decapitated heads. In its innermost cloister lurks the Colonel, the Minotaur of the place. He reads from Eliot’s “The Hollow Men.” Well, Marlow says of Kurtz’s encounter with the wilderness that its whisper proved irresistibly fascinating “‘because he was hollow at the core,” so there is that parallel with the original text. However, the contact with Conrad’s story has been harder and harder to maintain as the journey progressed. The scale has been grotesquely altered, the premises are different. Marlow was a free man, seeking understanding; Willard is a killer under orders. If he has learned so much on the trip into the interior, what reason has he now to kill the Colonel? Fidelity to duty? An act of mercy? Because the order of command must prevail in the general madness? The film doesn’t know and in embarrassment it turns mystical, with Colonel Kurtz’s execution juxtaposed to the ritual slaughter of a bullock by the Montagnard natives, and Willard walking thereafter, like a dazed avenging angel, through the catatonic followers of the slain Patton-turned-messiah. Nor do I think the Colonel was a true Kurtz. Conrad’s man of mystery, on Marlow’s word, came to abominate the colonial exploitation he represented so ably. He sided with the Africans, they adored him and he fell. But the Colonel does not hate the war; he hates the incompetents who are running it and the restrictions placed on its methods. His collapse parallels that of Kurtz, but the tragedy is trivial by comparison. The Colonel goes from gung-ho to spaced-out, a small jump. Coppola says he wanted to get to the moral issues that are behind all wars, but I think he has done no more than demonstrate the obvious-that in Vietnam we fought a bad war. He also says it is his notion that if the American audience could “look at the heart of what Vietnam was really like … then they would be only one small step away from putting it behind them.” Quite aside from the fact that Americans have shown a remarkable deftness at putting that war behind them, I have no idea what that lunar-landing statement means. As for the audience, I think it will see at the heart of Apocalypse Now an assertion that the war was one bloody huge circus, with clowns, acrobats, fire-eaters and a big brass band.